Does your dog tear up items in the home? Pulling & barking on walks? Is your dog ignoring you most of the time, except when there are no distractions and only when you have treats? The key when handling dog training problems, is not to attack the symptom (only what we see), but rather address the underlying root cause of that symptom. Just as you would not expect your Dr. to simply prescribe a pain medicine to cover up an ailment, you would expect them to cure what is causing that pain or discomfort. The same is true for dog training. If your dog feels the need to react toward other animals, frantically break out of a crate when left home alone, or coware in fear when out on walks, those are indications of a greater trouble. So instead of looking for the silver bullet of, “What is the one thing I can do to solve this issue?” – you need to look at the bigger picture by setting a foundation to work off of. Most dogs that display unwanted behaviors are fearful or lack confidence in themselves and you as their leader. This lack of confidence leads to them feeling like they must take matters into their own hands. So how do we develop a foundation to work from? I, like most trainers, take an “obedience-first approach”. Obedience-first means just what it sounds like, employing a sound obedience training system to develop true reliability when faced with high levels of distractions and without the need for treats. In doing so, we solve many dog training problems, without ever having to specifically address the symptoms. The variability of our human world imposes a lot of stress on many dogs. 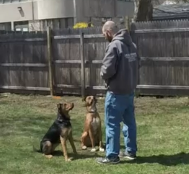 Obedience training reduces a dogs level of stress by providing something for them to focus on, establishing a clear system of communication, and teaching them to switch from an instinctual “autopilot” mindset to a more cognitive “decision making” mindset. Too many owners just “pass in the wind” with their dog. They give food, let them in the yard to go to the bathroom, and provide petting. 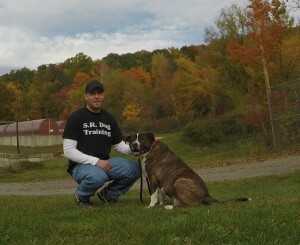 What owners lack is quality time with their dog. What separates a best friend from a stranger? Quality time spent doing meaningful activities. That is exactly what obedience training does for you and your dog. You will create mutual trust, respect, cooperation, and a sense of understanding based on clear communication. Most dogs react, rather than respond. They DO, simply based on instinct and impulsive feelings. This leads to behavior problems and stress for us, the human. How do we change that? We teach dogs alternative behaviors. If your dog chases squirrels, they can no longer do that if they reliably “Come” back to you as their alternative behavior. A dog can’t jump on guests if they reliably “Sit” instead. Dogs can’t pull or lunge on walks if they are “Heeling” at your side. The key to all of this is having reliable obedience commands. That is where the preemptive training we are discussing comes into play. As much as we would like to make our dog’s life perfect and give them everything they want, that is not possible. Just as with us, life has many stress producing variables. How a dog perceives: a new person, another dog, a passerby on walks, trips to the Vets office, shopping carts/baby strollers, etc. can be stressful, causing fear, reactivity, and pressure for a dog. 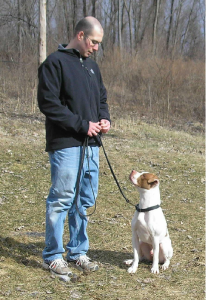 Obedience training needs to be practiced and developed before it is needed. Just as you must have your seat belt on before a car accident or working batteries in a smoke alarm before a fire. Having an obedient dog is insurance for life’s volatility and stress. The moral of the story is: Using an obedience-first approach lays a solid foundation, preparing your dog for life. In doing so, most owners never need to specifically address each individual behavior issue (symptom), because the greater underlying cause gets resolved through obedience first. This makes your life easier and your dog more confident in navigating our human world.